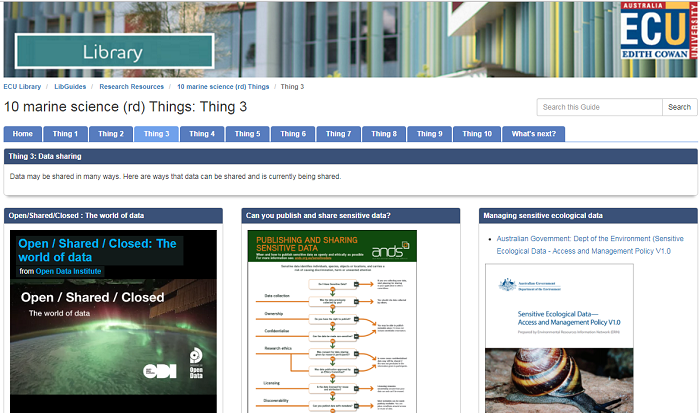 10 marine Research Data (RD) Things is a self-paced learning program that was developed from the 23 (Research Data) Things program and the extensive ANDS resources and materials related to research data management and re-use (under a Creative Commons Attribution 4.0 International License). Effective research data management (RDM) of Marine Science Data is increasingly recognised as a critical part of the research process. is a self-paced learning program that provides an opportunity to explore issues surrounding management of research data, specifically for researchers working with marine science data. How can I work through these Things? All Things have 1 to 3 Activities. You can pick and mix from the Activities to suit your interests. You can do as much or as little of the Things and Activities as you want to do, or need to know. Some of the Activities are intended as an introduction to a topic, and some delve a little deeper. Choose what interests you and suits your experience. You can work through Activities on your own at your own pace, or in a group. What are the topics and subtopics in the 10 Things? Research data comes in many shapes and sizes and its management changes over time. Kick off your research data journey by exploring different types and forms of research data and how they fit into the research lifecycle. Activity 1: What is research data? Research data is critical to solving the big questions of our time. So what are some of the issues we face in managing research data? Activity 2: How do you manage "Big Data"? Data may be shared in many ways. Here are ways that data can be shared and is currently being shared. Can you publish and share sensitive data? Here various data portals and repositories are explored. Data sharing policies are becoming increasingly common in Australia and internationally. Learn why research funders and journal publishers are particularly influential when it comes to encouraging data availability. Metadata elements are essential for finding and reusing research data. Data is only as valuable as the metadata which describes and connects it. In addition to selecting a metadata standard or schema, whenever possible you should also use a controlled vocabulary. A controlled vocabulary provides a consistent way to describe data. Citation analysis and citation metrics are important to the academic community. Find out where data fits in the citation picture. Understand the importance of data licensing, learn about Creative Commons and see how licensing data can assist in creating links with business and industry. Some research institutions and research funders now require researchers to submit a Data Management Plan (DMP) for new projects. What should a DMP cover? Could you help with one? Dig in to dirty data. What is it? Why should we care? Try your hand at using an open source data cleansing tool. Reflect on the changes you could, and perhaps should, make in research data management practices which will enable the ethical and efficient publication of marine science data for reuse by the research community.